Online dating in Ireland is much smaller than it is in the United Kingdom. Don’t let that deter you though. There are quite a few solid dating sites that you can use in order to find your perfect match. Speaking of busy people, your best best results from dating in Ireland will happen if you live or stay close to the hustle and bustle of Dublin, which is where most of the single men and women are clustered. Another benefit of being in one of these cities is that opportunities for offline dating will also more abundant. Without further ado, here is the quick list of the top four dating sites in Ireland. I’ll go into more detail in my reviews below. Match.com Ireland (a.k.a. Ie.Match.com) is the best online dating site in Ireland. Ie.Match.com is the Irish version of the popular site in the United States, Match.com. Rest assured, the Match.com brand is one of the most powerful in the business, and this Irish version knocks the ball out of the park. The minimalist design of the site makes it easy to navigate and use. However, to be a member of the site, you have to be located in Ireland. Even if you manage to access the site from outside of Ireland, eventually the site will be able to discern your location and lock you out. Creating an account is easy. The site asks for a username, password, email address, birthdate, your gender, and the gender you are seeking. The questions don’t need to be answered immediately. Searching the site through the tabs at the top is a good way to begin. The site can learn your preferences by the kind of profiles you select to view. Basic search: Search by birthday, or let the site choose your Perfect match, Mutual match or Reverse match. Advanced search: Check boxes to fine-tune your search. Select location, age, lifestyle choices or appearance. Shuffle: This method, popularized by Tinder, is a randomized search where you can like and dislike profiles, and be told if you have found a mutual match. With a free membership, browsing and searching are unlimited. You can also send Flirts. To talk to another member, however, a premium membership is required. With a premium membership, you can send messages. You can also start chats with people who are online. There is at this time no video or audio chat. 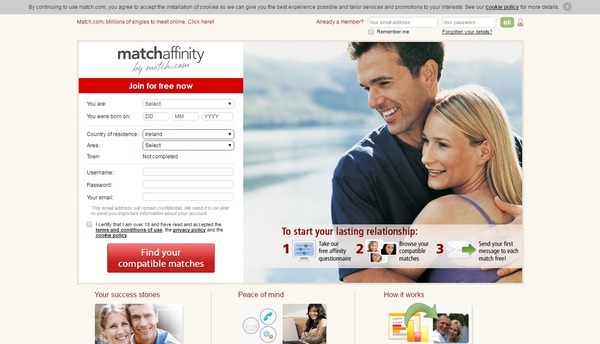 MatchAffinity is a solid option for Ireland if you are looking for On the dating site MatchAffinity.com, potential matches are chosen based on the results of an Affinity Questionnaire. All you have to do is fill out the questionnaire to find dating matches, but MatchAffinity encourages users to have fun exploring the site. Most MatchAffinity members are seeking commitment from future romantic partners, and the overwhelming majority are between 25 and 55 years old. The entire process for becoming a member on MatchAffinity.com takes about 25 minutes, which includes providing answers to the Affinity Questionnaire. There are about 100 questions which cover more than 70 psychological areas from basic values to views on home and family. Members are encouraged to upload at least one photo to the site, but all images must be approved by site moderators and may take up to 24 hours before showing up on your profile. You will receive a personality report based on the answers you gave to the Affinity Questionnaire. These reports are compared with other member results stored in the site’s database so that your views on life and values, and your unique personality, can be aligned with those of potential partners. MatchAffinity software can also filter out what it determines to be fake profiles, and I don’t think I came across a single fake-looking profile the entire time I was on the site. Members interact with each other using the on-site email feature. Two types of membership are offered by MatchAffinity.com: free and premium. Any user – free or paid – can complete the Affinity Questionnaire and review their personality reports as well as suggested partners. Free users are allowed to make initial contact with other members but must have a paid subscription to continue communicating with other site members. With free membership you don’t get to see user photos. You have to be a paid member of MatchAffinity.com to see what your dating prospects actually look like. Parship.ie is the Irish branch of the internationally recognized dating website, Parship.com. Founded in 2001 in Germany, Parship now reaches users across the globe, including European nations (France, Holland, Spain, England, Italy and Sweden) and Mexico. Parship’s effective matching algorithm caters to those who are committed to finding a partner. Registration is an in-depth process that involves a personality assessment which is used to determine the best matches. Casual users may find the registration process to be excessive, but the personality assessment can be enjoyable and enlightening. Parship is great if you are seeking a meaningful relationship in Ireland. Users register by selecting their gender and the gender of their desired match. They also provide an email address and create a password. The next step is completing the PARSHIP Principle, which is a scientifically designed personality survey. The survey can take anywhere from 20 to 60 minutes. Users who have experience with personality assessments will find the process less time-consuming. The survey includes multiple choice questions and open-ended activities such as selecting a preference from two abstract images or inventing a title for a dream image. Even after the survey, the user profile is only 35% complete. The complexity and length of the assessment deters casual dating site users. Parship relies more on its partner suggestions than on user searches, but he or she can filter the suggested matches. As users begin to explore their matches, they will only see indistinct photos unless they subscribe to Parship’s premium features or receive access to the photos from the singles themselves. Another privacy feature prevents users from seeing their matches’ names, initially. Instead, they see their occupation and are allowed to assign nicknames to distinguish interesting profiles. New users must complete 50% of their profile before communicating with other singles. After this, they have the option to add profiles to “favorites,” release their profile photos to others, send a compliment, a smile, a small “icebreaker” survey or a text message. Parship relies on detailed profile information as its most effective communication method. Parship’s matching methods are the product of forty years of research by a Hamburg University Psychology professor. Premium users’ survey evaluations are essentially forty page psychological evaluations. Even free members receive numerous benefits. Their survey results are informative because they reveal features of their personalities and character traits of singles best suited for them. While GetOut is an online dating site, as the site’s name implies, the focus is more on making a connection offline as opposed to online. 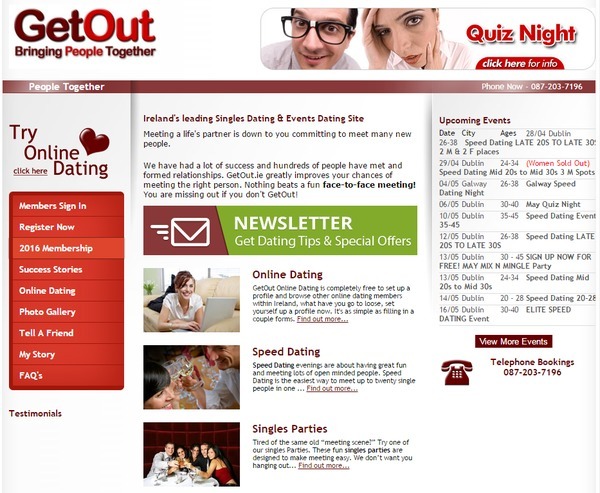 Launched in January 2008, the site runs regular social and activity-based events in Dublin and elsewhere around Ireland for those who are single, divorced, and/or separated. With that said, their online dating site is chock full of profiles, and the site offers a basic search messaging system that enables you to connect with other members. Registering a profile is straightforward. Be sure to also check out the events after you sign up so that you can get the most out of this site. The best way to connect with other members is to attend one of GetOut’s offline events, such as Speed Dating. When you attend a Speed Dating event, you are welcomed by a GetOut Host when you arrive who will give you a scorecard and a name tag. Once all of the speed daters have arrived, you will sit down at a table that has the same number as the number on your name tag. The GetOut Host will then do a brief rundown of how Speed Dating works and then open the floor up for questions. 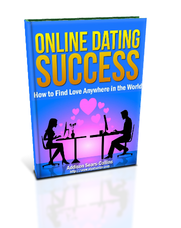 You typically will have anywhere form 3 to 5 minutes to speed date with a particular member. After the time expires, you will move on to the next person. You will do this again and again until you’ve had the chance to speak with everyone in attendance. Communication is best done offline at your choice of Speed Dating, Quiz Nights, Dinner Dating, Parties, and Adventure Days. Costs for these events vary, so consult the website. Speed Dating and the Singles Parties make GetOut worthwhile. It can be difficult sometimes making connections online because the unspoken communication that is such an important part of determining if you have chemistry with someone, is missing. The GetOut hosts do a good job to make sure that everyone is actively engaged.